Edinburgh Monarchs intend to make an announcement later this week regarding the team’s captaincy for the forthcoming season. 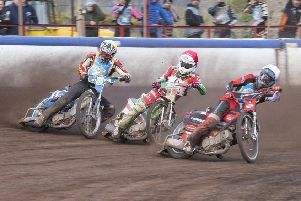 Following the decision of long-serving skipper Derek Sneddon to quit speedway after guiding the Armadale outfit to the title last year, speculation has grown as to who would take over his role as Monarchs aim to replicate last season’s exploits. With their season beginning on Sunday afternoon against Glasgow Tigers in the Spring Trophy, Monarchs co-promoter John Campbell explained that a decision will be made before their trip to Ashvale. It now seems likely that the new captain will be unveiled at Monarchs’ press and practice day at Armadale on Saturday. Many supporters’ feel Aussie ace Sam Masters would be a good choice. He has an easy-going manner and is liked by the whole squad. Crucially, he has begun this season in the same positive manner as he finished the 2014 campaign, winning the individual event in Theo Pijper’s Testimonial meeting on Friday. Masters also performed well at Monday’s Olympique event in Wolverhampton. Meanwhile, Monarchs No.1 Craig Cook has been included in the Stal Gorzow side for two upcoming friendly meetings. Cook has been in Poland trying to impress his new club, with their coach describing the Whitehaven-born rider as “fun and exuberant”.